The Vedas, Epics and Puranas of ancient India describe an interesting concept of time called Kaalachakra, the wheel of time. This wheel of time is conceived as having twelve spokes indicating twelve points of time measurement on the wheel of time. Close examination of the imagery reveals that this concept is related to the Yuga System and used for various kinds of time measurements in ancient India. 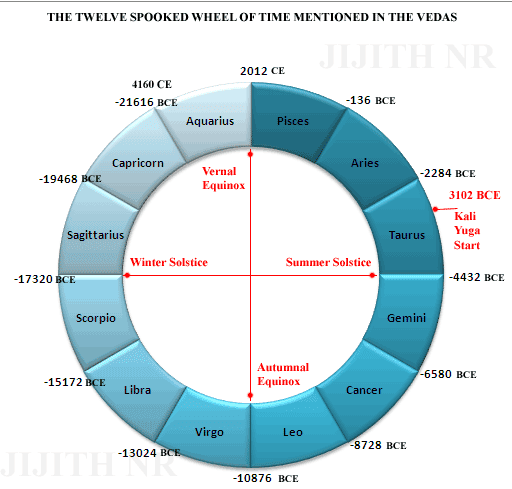 The same wheel of time is used to measure hours in a day, months and seasons in a year and large units of time like Yugas, which appear like seasons lasting for thousands of years as part of the 25,776 years long "Great Year" resulting from the precession of Earth's Axis of Rotation. Close to Equator in Southern India, the Sun traverse a path close to celestial equator, rising in the east and setting in the west, reaching zenith at noon. Besides this daily motion, Sun also makes a pendulum like motion on an yearly basis moving northwards and southwards clearly observable in northern India, 35 degrees north of equator. Ancient Indian astronomers, which includes many Vedic seers in northern and southern India, knew very well the reasons for all these movements. They were aware that Earth is a sphere moving around sun in an year, with a tilted axis, where it rotates once a day and that the axis of rotation itself will make one turn in around 26,000 years. They knew that daily motion of sun in the sky is due to the rotation of Earth on its axis. They knew that yearly pendulum like motion of Sun in the sky to north and south is due to the yearly revolution of Earth in its orbit around Sun with a tilted axis of rotation. All these motions are partially confined in a band of region in celestial sky around 20 degrees north and south of the celestial equator. This band is called zodiac. It resembles the wheel of time (Kalachakra) and is one of the many aspect of the wheel of time, the other one being the orbit of the celestial pole in the sky. The zodiac is the region where the sun, moon and the five visible planets apparently wander in the sky of Earth. This region was of tremendous important for the ancient astronomers. It was divided into 12 constellations or regions where easily recognizable configurations of well known stars were defined. The twelve constellations were thus defined as stellar formations in the shape of fish, ram, bull, crab, lion, scorpion etc. These 12 constellations are Pisces (the fish), Aries (the ram), Taurus (the bull), Gemini (the twins), Cancer (the crab), Leo (the lion), Virgo (the virgin), Libra (the scales), Scorpio (the scorpion), Sagittarius (the archer), Capricorn (the sea animal) and Aquarius (the pot bearer). Each of these regions span around 30 degrees of the Zodiac wheel. These 12 regions are also called the 12 zodiacal signs and is one of the basis of astrology besides being fundamental to ancient astronomy. The ancient astronomers also knew that the axis of rotation itself is slowly rotating, something which require many thousands of years of careful observation. All of these developments are already discussed in the article named Yugas. Sun moves from eastern horizon to western horizon reaching zenith at noon. During zenith position sun's rays reach us perpendicularly and we feel maximum heat. During morning and evening sun's rays reach us with an inclination so that it travel a longer distance through atmosphere which dissipate much heat before it reach us. This changes create a smaller version of seasonal changes that we observe through out the year. The various seasons are the result of yearly motion of Sun in the terrestrial sky. The movement of Sun in the sky to the north is called Uttarayana. The movement of Sun in the sky to the south is called Dakshinayana. These apparent movements are due to the combined effect of Earth's motion in its orbit around Sun and due to the 23.5 degree tilt of Earth's Axis of Rotation. These motions are linked to the four important days of the year viz. Winter Solstice, Vernal Equinox, Autumnal Equinox and Summer Solstice. Uttarayana (northward motion of sun) commence after Winter Solstice day when northern hemisphere observe longest night. During Uttarayana at one point day and night becomes equal and that is Vernal Equinox day. Uttarayana ends at Summer Solstice day when the duration of night becomes lowest. After this Dakshinayana (southward motion of sun) begins. During Dakshinayana at one point day and night becomes equal again and that day is Autumnal Equinox day. The position of sun against the background of stars in the sky, during all these four days viz. Winter Solstice, Vernal Equinox, Autumnal Equinox and Summer Solstice is considered as four crucial points in the zodiac. These four points constitute "the four corners of the sky". They are figuratively praised in the scriptures as the four great supports of the sky and as the four pillars that uphold the sky, due to obvious reasons. When Sun moves to south and reach the southern most point in the celestial sky, Sun's rays reach earth obliquely. This reduces the amount of heat reaching northern hemisphere, due to reflection and refraction of sun's rays in the atmosphere. This generate a cold climate in northern hemisphere and causing winter season. Similarly when the Sun moves to north and reach the northern most point in the celestial sky, sun's rays fall in northern hemisphere perpendicularly causing maximum heat in northern hemisphere and thus summer season. In this way all the seasons are resulted from the motion of Sun and due to the resultant change in the energy distribution and energy flow in Earth's atmosphere. The seasons are six in numbers (Shad Rtu, six seasons):- Vasanta (Spring:- February & March), Greeshma (Summer:- April & May), Varsha (Rains:- June & July) Sarath (Autumn:- August & September), Hemanta (Pre-Winter:- October & November) and Sishira (Winter:- December & January). The English months given are approximations. Seasons change widely in northern and southern India. Besides these seasons shift their temporal location in course of several centuries. Ancient Indian Astronomers including Vedic seers and Valakhilyas were keen observers of the motion of sun and were keepers of centuries long tradition of watching the movement of sun across the background of fixed stars and stellar constellations in the sky of Earth. They observe the position of Sun during Winter Solstice, Vernal Equinox, Autumnal Equinox and Summer Solstice in the background of the constellations observed in the sky. In a period of one or two years no change is noticeable. But in the course of a century, changes are noticeable. Due to the precessional motion (rotation of Earth's axis) the position of sun at Winter Solstice shift with respect to the stellar background by 1 degree in 71.6 years (length of the life of an average healthy human being). It traverses 30 degree or one zodiac-sign in 2148 years. It completes 360 degrees of one full circle of the zodiac in 25,776 years. This 25,776 years is figuratively called the Great Year, the Divine Year and One Year of the Devas. Similarly all other points (Vernal Equinox, Summer Solstice and Autumnal Equinox) that constitute the "four corners of the sky" too shift following the Winter Solstice. Along with the four crucial points of the sky, all the six seasons too are shifted. The shift progress in the anti-clockwise direction, ie instead of moving from Aries to Taurus to Gemini, they move from Aries to Pisces to Aquarius. Calenders are systems of time framework that help us to know what day of month it is and what month of an year it is. Calenders also count years from the year of start of the calender system. Examples of Calender systems are Shaka Calender established in 78 CE, Kolla Varsham Calender established (or rather re-established) in 825 CE, the Julian Calender established in 45 BCE and many more. A 1 degree shift of Winter Solstice does not cause any disturbance in the calender system. But in a period of 2148 years (ie in around two millennia) the shift will be around 30 degrees, which is equivalent to one constellation in the sky and one month of an year. This is substantial change which makes all existing calenders useless. For example if one do not make any change in the existing calenders in 2148 years we will see that seasons are shifted by a month. For example, 2148 years in the past, ie in 136 BCE, Vernal Equinox occurred in April 21st instead of March 21st. Then spring started in January rather than in February. Often calenders are designed such that Vernal Equinox is close to the beginning of the first month / first zodiacal sign. After 2148 years this no longer will be true, causing the astronomers to redesign their calenders. Some calenders adjust themselves to shift of equinoxes and solstices by changing the first month of the year. Some other calenders are discontinued and new calenders are adopted. Often the new-year date of discarded or destroyed calender is still remembered as a celebration. In some cases the practices followed in old calender continues to be part of some traditions though not attached to the active calender system. As an example of self-adjusting calender we have the astrological calender followed in Kerala, the southern state of India. In this calender the astrological year starts with Pisces (Meena) rather than with Aries (Mesha / Meda). Currently the Vernal Equinox is at the beginning of Pisces, ready to enter Aquarius. So it make sense to consider Pisces as the first zodiac sign or the first month. The Kolla Varsham calender in Kerala consider Leo (Simha / Chingam) as the first month of the year. Vernal Equinox was at the beginning of Leo, ready to enter into Cancer in around 8728 BCE. Thus this calender in Kerala is a remnant of an old calender that started in 8728 BCE when this region was ruled by a king named Mahabali. The first day of Chingam is considered as a New Year and the day when Moon in this month comes close to the star Sravana is celebrated as Onam a great festival associated with king Mahabali's return from his exile in Patala (South America). Another New Year in Kerala is celebrated based on another calender in the month of Aries (Mesha / Meda) named Vishu or Vaishakhi. The date of this New Year usually falls in April 14, 15 or 16. It is now celebrated as an ancient Vernal Equinox. A Vernal Equinox in April 15 means it occurred 25 days later than March 21st (current date of Vernal Equinox). Since 365.25 days of the year corresponds to 360 degrees of the zodiac, 25 days corresponds to 24.64 degrees. One degree shift requires 71.6 years, so 24.64 degrees shift requires 1764.27 years. So Vernal Equinox was at April 15th 1764.27 years ago, ie in 247 CE. During this time Vernal Equinox point was still in Pisces but very close to the beginning of Aries. Hence the builders of calender in those days chose Aries as the first month and first zodiac sign. Arrival of calender start dates based on Gregorian calendar is not absolutely accurate because of errors in Gregorian - Julian calender and because of the Luni-Solar nature of the Vishu Calender due to which New Year day (Vishu) varies as April 14, 15 and 16. As per Julian calender one year is 365.25 days. Gregorian calender corrected it as 365.2425. But Ancient Indian calenders were based on more accurate calculations which consider an year to be 365.2421756 days (only 1.4 seconds shorter than the modern scientific value of 365.2421904 days. See:- maya-s-theory-of-sun). In some cases, the practices followed in old calender continues to be part of some traditions though not attached to the active calender system. 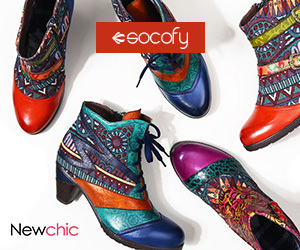 For example in Western Astrology, Aries is considered as the first sign. Vernal Equinox was at the beginning of Aries ready to enter Pisces in around 136 BCE. This period was also the beginning of modern western astrology. There is a huge debate going on if the predictions based on western astrology needs to be shifted by a month. In my opinion, this depend on whether western astrologers want to base their predictions on the fixed zodiac or on the equinoxes and solstices which keep on moving around 1 degree every 72 years. Much like the division of sky into 12 zodiac signs, the Nakshatra system is a unique division of sky into 27 parts using 27 easily identifiable stars in the zodiac, ie in the path of Sun, Moon and the planets. Some astronomers identify 26 and some others 28 such stars and hence the division of zodiac based on Nakshatra-system may vary from 26 to 30. In case of 26 Nakshatras, crossing of one Nakshatra region by Vernal Equinox will require close to a millennium (991.3846 years). In case of 27 Nakshatras, one division will span 13.3333 degrees (ie exactly 13 degrees and 1/3 degrees more, a more manageable fraction). When 30 Nakshatras are used one division will span exactly 12 degrees. 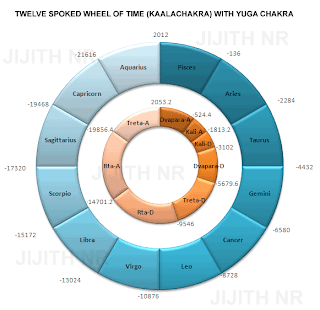 The most popular Nakshatra system uses 27 Nakshatas. The system which provide ease of observation and which deals with more manageable fractions is preferred. Kaalachakra with Yuga Chakra Inside. A refined Markandeya Yuga Chakra with Ascending and Descending Chaturyugas each with a duration of 12888 years is depicted. Negative Numbers are BCE years and Positive numbers are CE Years. The Yuga System existed side by side with Nakshatra System (with its 27 divisions of zodiac) and with the Kalachakra system (with its 12 divisions of zodiac). But it has more to do with historical or geological epochs and less with astronomical observations. However the historical events expressed as having occurred in a particular Yuga may be fixed in time axis using astronomical observations. There are some indirect correlations with Yuga System and with Kalachakra (12 spoked wheel of time or zodiac). It has mainly four divisions called Rta Yuga, Treta Yuga, Dwapara Yuga and Kali Yuga. The divisions can be of equal size (1:1:1:1) or follow a ratio (4:3:2:1). The four Yugas together is called a Chatur-Yuga. In some definitions there are both ascending and descending Chatur Yugas. An Ascending Chaturyuga is defined starting with Kali Yuga, then Dwapara, Treta and Rta Yugas. After this the Descending Chaturyuga proceeds as Rta, Treta, Dwapara and Kali Yugas. The duration of a Chatur Yuga varies based on the definition as 10,000 years (Sanjaya's Definition), 12,000 years (Markandeya's Definition) or 4,320,000 years (Shanti Parva Definition). Of this the 12,000 years Yuga defined by Markandeya is the one that aligns closely with the 25,776 year long axial precession if ascending and descending Chaturygas are taken together (a total of 24,000 years). Markandeya system also has the concept of dawn and eve. These are periods with 1/12th of the size of Yuga duration at the beginning and end of each Yuga were the effects of the adjacent Yuga too is felt. For example, the dawn and eve of Kali Yuga having 1200 years duration is 100 years each and that of Dvapara Yuga of 2400 years duration is 200 years each. In 4,320,000 year long Chatur Yuga definition 12,000 year long Markandeya Yuga duration is multiplied by 360 saying 360 human years constitute one year of the Devas. Actually what is meant here is that 360 degree motion of Vernal Equinox (ie one revolution of Vernal Equinox or one complete turn of axis of rotation due to precession) in 25,776 years constitute one Great Year, which can be figuratively described as One Divine Year or One Year of the Devas. But this does not require any multiplication of 12,000 years with 360. This error in the Shanti Parva of Mahabharata is copied into all Puranas including Vishnu Purana and Bhaagavata Purana. Currently many Hindus believe in this 4,320,000 year long Chatur Yuga in which current Yuga viz. Kali Yuga is thus unnecessarily and erroneously long (432,000 years long). Markandeya Yuga system itself seems to be an approximation of the actual Chatur Yuga definition which was half the size of axial precession period (ie 12,888 years) so that ascending and descending Chatur Yuga will constitute one complete precession in 25,776 years. Such approximations are rampant in ancient Indian scriptures to facilitate easy memorization. For example the number 71.6 (the number of years taken for the Vernal Equinox to traverse 1 degree in its circular motion) is often approximated as 72 and is found in Vedic hymns. A refined Markandeya Yuga Chakra with Ascending and Descending Chaturyugas each with a duration of 12888 years is depicted. Dawn and Eve of each Yuga is marked. Negative Numbers are BCE years and Positive numbers are CE Years. The beginning and end of each Yuga is marked by an event especially the death or birth of a historical figure. The Descending Treta Yuga is marked by the death of Rama and the Descending Dwapara Yuga is marked by the death of Krishna. Birth of a king named Avikshit is mentioned as the beginning of Descending Treta Yuga. At the beginning and end of Descending Rta Yuga there were floods. There were floods in the beginning of the Descending Treta Yuga. Sarayu river that flows through Rama's city Ayodhya, was flooded during the end of Descending Treta Yuga. Dvaraka, the island city of Krishna was submerged due to flooding of sea water at the end of Descending Dwapara Yuga. Saptarshi is the name of a constellation near celestial pole and also the collective name of the seven sages who carries forward the secret of Kalachakra. This constellation also plays a role in the movement of the wheel of time as some of the stars in it becomes the pole-star due to the precessional movement. It is known as Big Dipper and Ursa Major (Great Bear) in western astronomy. The names of the seven sages differ based on the source text. Popular list include Bhrigu, Atri, Angirasa, Marichi, Pulastya, Pulalaha and Kratu. Sometimes Marichi is replaced by Vasistha and either Atri or Kratu replaced by Agastya.